Write Articles, Earn a Holiday Mug! Finish 2009 by completing this 10-day “mini-challenge” and you’ll earn a limited-edition EzineArticles holiday mug! Submit at least 25 qualified articles between 12:01AM CST-USA today (12/23/09) and 11:59PM CST-USA on New Year’s Day (1/1/10). After you have submitted 25 articles, and prior to 11:59PM CST-USA on January 7, 2010, send an email requesting your mug to holidaymug@ezinearticles.com – you’ll receive an automated email response. Confirm your shipping address is correct in your EzineArticles profile. We’ll only ship these mugs to confirmed postal addresses worldwide. 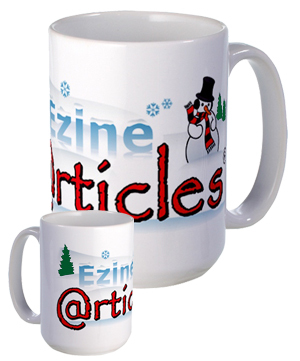 Do those 3 things and you’ll receive one of these limited-edition EzineArticles holiday mugs. There’s no need to sign up. It’s that simple. We’ll announce the first names of the winners in the comments section of this Blog post on Monday, January 11th. Hope to win the mug. Cool. Another chance to get a second mug and to start my “collection” for real — albeit one with a pretty tight deadline. Good thing I enjoy staying in the Holiday spirit well into the new year since technically the holidays will be way over by the time the mug arrives. Too bad the articles I write for my clients won’t count — or else this would be a piece of cake. Then again, this way, I’ll be pushed to write articles for myself too. This is great! One question, is there a minimum limitation on the amount of words to be used for each article for the event? For you, 400 words… for everyone else, the usual 250 will do. 250 words is the minimum per article. How, how, how, Brother Knight; Merry Christmas:)! You can count me in! I’ll start writing now. It’s too cold in England to do much else. Happy Christmas all. Looking forward to earning my mug! I just really want that mug. To remind me something I did in 2009, will be coming to me in 2010. A good reason why I want that mug is because, I am cutting back on going to coffee shops and making my own coffee at home. If I go to coffee shops I tend to get all the bad stuff in my coffee, like cream and sugar, If I have a coffee at home… I control the amount! Taking a better look at health in 2010! I’m not even a coffee drinker myself… so I like to have ice cubes in mine and I pour Sobe Adrenaline Rush in mine. Everyone who submits 25 or more articles within the time period above gets the limited edition mug. Nice contest, but I dont think Ill be able to participate. Good luck to everyone! why you restrict yourself by saying you can’t? My best wishes to all authors that have enough time and disposition to accept this challenge! Just want to confirm my understanding of the rules – we need to write at least 25 articles & post them on our own blog sites, then send an email to Ezine with a link to the site containing the articles? but rule 3 states shipping address in EzineArticles profile, wouldn’t having an EzineArticle profile constitute signing up? Please clear this up for me – thanks. Rule #3Confirm your shipping address is correct in your EzineArticles profile. We’ll only ship these mugs to confirmed postal addresses worldwide. There’s no need to sign up It’s that simple. Sorry for the confusion. I was referring to the challenge itself when I said, “There’s no need to sign up.” – not EzineArticles membership. You need to be an EzineArticles member and submit 25 articles through our system in order to qualify for the challenge. What about those of us who aren’t Platinum yet – as your editorial team is just about to pack up for the holidays. How can we qualify If we can’t submit articles? We’re not packing it up for the Holidays. While it’s true we’re almost done for the week in the next few hours; we will be here next week. Also, magically, your account has at least 25 more article submission credits…so have no fear, your account will allow for the submissions without problems. Lastly, we’re pretty much on top of accounts that are at zero submissions left and will be intra-day checking them thru the end of the year. It is great to have the owner of an article directory who thinks about his authors. I’ve got several articles ready to submit, but still have 0 submissions. Is there a chance it will still open up? Sounds like a good motivator for me. If I write 25 articles, I will more than double my total submissions. I have been writing articles since January of this year. Good luck for everyone,I’m a new member here, so submit this articles is so difficulty to me ,Although I like this particular mug?From now on ,I’d like to practice to write articles and strive to be better prize in next year. Just when I thought I might take a few days off from writing! i will try this out and will win that holiday mug. What a big treat from Everybody’s Angel! I really appreciate such a good gesture of giving us a token of encouragement for writing more quality articles. Keep up the good work EzineArticles staff. You are all great people. Cheers! This sounds like an excellent oppurtunity for us to share articles on Running Easy. Especially with people keen to lose some Christmas excess and set some awesome new years resolutions. We also currently offering a free Marathon Training book so this would be great opportunity for Ezine readers who are interested in achieving this incredible goal easily. So putting it simple, all we have to do is submite 25 on Ezine @rticles and have them approved within the time limit. Right? Nope, all you have to do is submit 25 articles within the time limit. Provided they are legitimate attempts to create quality articles that could eventually be approved, they’ll qualify. Don’t forget, you’ll also need to submit a prize request email to holidaymug@EzineArticles.com to receive your mug! Nice looking mug! Will give 25 articles a shot. I am continually amazed by the number of invitations, etc., which are posted using what I consider to be incorrect time designators. I was absolutely shocked when I saw that this contest is timed using CDT! I KNOW Chris and his gang know better, but somehow it happened. I ‘spose “cut ‘n paste” from the last invitation bit ’em, but that’s no excuse. Or do you really man CDT, Chris????? Worse yet, when I try to explain it to a lot of folks, they don’t have a clue what I’m talking about. Bet that won’t happen here. We’re in CST (Central USA Standard Time). CDT means “Central Daylight Time”. Yes, that was a typo because CDT only applies in our Summer months. I updated it. Good catch! Yep, that was my typo – the result of cut/paste and trusting the guesses of others. Sorry for the confusion and thanks for bringing it to our attention. Funny how some folks spent 10% of the EzineArticles minimum to say they don’t have time to participate in this challenge. Thanks for another great motivator. Do these articles all have to be under the same pen name? I am an EzineArticles author, but write under several pen names. Thanks for clearing that up. I am the proud owner of two mugs and once again find myself suffering from “mug lust”. My understanding from all of these challenges is that the 25 articles must be under the same pen name- not spread out among multiple pen names. However, if you completed 25 per each pen name, you would qualify for multiple mugs. Lisa is correct. As with all EzineArticles Challenges, you can’t pool multiple authors together, but you can qualify under each author separately. #HAHD 2 had one member who received 7 prize packages! Now my students are getting excited about this challenge. I need to write 11 more and I’ll be there. It’s interesting how we can be motivated to do what is good for us anyway. This is awesome! I need the boost…talk about a way to jump start my article marketing productivity! Thanks to EzineArticles and special thanks to Connie Green for the announcement! This is great. I wanted to commit more to writing during this break and this is just the motivation I need. Thank you Connie Green for the notice. April and Robin – I am thrilled to see you here and working on the article challenge. This site, and the people here, have helped me to change my life! Connie you’re everywhere… it seems! Glad to see you here as well, you provide a great example for us. PS. I’ve written and submitted 3 articles today…working on my 4th to catch up! This is insane but count me in! Have already written 5 and looking forward to writing 20. How in the world I’m going to do that I absolutely do not know but I’m determined to do it and can already imagine myself sipping some nice English tea from my EzineArticles mug. This is such a great idea I think I’ll incorporate it into my business in one shape or form. Really feeling motivated. Love all the challenges you set out here for us. This is going to be a tight challenge since I just came across it now but I’m in! From my heart space I want to thank EzineArticles again for another fun challenge and I’m delighted to be part of this task. Thanks. Greet chance from EzineArticles, I think is appropriate idea for new members. Hello. I got a problem. My account is Basic Plus, so i coud only posted 24 articles and now i am waiting for my articles to be reviewd and my account. Most likely my account wont be reviwed before 1.1.2010, so i have no way to post at least one more article to participate in this mini-chalange. Does anyone have an idea about what i can do. We are reviewing accounts for upgrades intra-day. This means that once you run out of submissions you will not go more than one day without a review of your account. We are also 2-3 days behind on our article review times but this is simply due to the holiday break. We will be back on target with no more that 12-48 hour review time within a day. I did review your account and I don’t see any articles submitted or pending. I did review your account. Please see your email for more details. Okay, crazy it might be, but I’m in. I was going to submit to-day, my first ever article & received the announcement re the challenge just now. Talk about ramping it up a notch or two! Yes, now I am scared! A big thanks to EzineArticles. I have been receiving enzine articles for the last eight months, so does this make me a member or do i need to pay some money to become a member? Because i really want to take part in the competition so that i can get myself a mug to be able to enjoy my iced coffee. I enjoy articles about relationships, customer service, stress management.They have really helped me, i even apply them at the work place. Please reply immediately because i need to take part in the competition before the deadline. Thank you very much. Look for our “Learn How” icon on the right side of the page. This may help you along. You don’t need to ‘join’ or pay a membership. Just sign up for a free account and start submitting your articles. Your topics sound perfect. Just start writing and submitting. The submitting part is easy, so get busy writing and you’ll be away and in no time you’ll have your 1st EzineArticles mug. I’m looking forward to receiving my first one. I’ve got 11 articles written and 14 to go in 3 days. Yippee! This will be exciting for me again, beating deadlines! But I only have 20 slots left for article submissions. How will I get to submit the other five? Thanks, I will try to have this precious mug from EzineArticles, Sir. GOD bless and Happy New Year everyone! Okay, my 25 are submitted. Don’t forget to send your email to claim. Where do i go to in case i want to start typing the articles? I have run out of article submissions. I want to join sending 25 articles to get an Ezine Mug. Long Live Ezine – Happy 2010! Only thought I’d give this a try a few days go. Never mind, at least it’ll motivate me. Nice way to warm up for the #HAHD challenge. And only one day left in the challenge. How is your politics in these cases? Happy New Year to you and the EzineArticles team. We review accounts for upgrades on a daily basis. You will not go without an account review for more than 12-24 hours during normal business hours. I have submitted 26 articles, all approved and sent my email. With all the excitement I have just come to read everyone elses comments. It appears I am not eligible because I have submitted them across a number of pen names. Is that correct? I must have missed that in the competition rules. Oh, Susan, I feel sorry for you. But the day is not over yet – how about writing some more? Unfortunately, you are correct. You cannot combine authors to meet the qualification guidelines. The flip-side of that is that you CAN qualify with every author name you write under. Our last #HAHD had one member who qualified 7 times. Ok, well I had better give it another shot! At least I will know next time! Plus I see from Elisabeth’s question, we have a bit more time up our sleeve. I wish I didn’t write 500 word articles all the time! I did it with one extra…and all around the 500 words for you Marc! Now I look forward to that mug! Once in a blue moon I will take on a challenge that stretches me to my limits. With a house filled with guests, traveling between two cities for Christmas, my 92 year old mother who is recovering from hip surgery, and the normal routine of running my online business, I was able to write 25 articles in 10 days. Wow, just submitted my 25th, this was harder than I expected. It does mean that about 20% of all my articles have come in the past week, good thing I was on vacation. The mug I got when I turned platinum is one of my favorites, it holds two cups of coffee. It was a worthy challenge to try to get another one. I’m not sure about the 100 in a 100 though, that might wear me out. We do have until TOMORROW night, right? You are correct! =) The holiday mini-challenge ends at midnight tomorrow night. The observant author will realize that there’s a one day overlap between this challenge and #HAHD 3. So any articles submitted on 1/1/10 will count for both challenges. This challenge really got me thinking about re-purposing lots of great original content I already had on my computer. Doing that made this challenge no problem! Now I’m out of stuff to repurpose though so for the #HAHD I’ll be writing daily to get them all done! Just had my 25th article approved today so I’m off to send that email. Thanks! I’m stuck with no more article submissions. I need 6 more. Can anyone help so I can win the mug? Thanks for a great mini-challenge. I can’t wait to get my new snowman mug! Now, how do I confirm the shipping address? Is it just a visual confirmation? Your address is under the Account Manager tab when you are logged in- the second tab over right beside your Article Manager page. Under Change Account Information you will find your address. Just make sure it’s correct. This was a great mini contest! I’ve already submitted my last article today. Is it important to wait for our articles to be approved before sending the email requesting our mug? I checked my profile and I can’t seem to find my address anywhere. Where is it and how can I confirm it? You don’t have to wait for approval. You can send your email now. Your address is under the Account Manager tab when you are logged in- the second tab over right beside your Article Manager page. Under Change Account Information you will find your address. Lisa hit it right on the nose! Congratulations on qualifying. Oh darn! I missed the deadline by about a minute and a half. My 25th article clocked in at 1:01 a.m. EST which is 0:01 CST. Either way, at least I’ve got 25 (actually 27 — I just kept going) new articles that are going to be approved pretty soon — I can imagine that a lot of people pulled a major last minute effort and so the reviewers are going to have their work cut out for them when they come back Monday morning. Sorry you missed the deadline… actually, by server time…you missed it by 1 minute and 31 seconds. On the bright side, you’ve got a jump start on HAHD 3! thanks! That would be GREAT! I hope I didn’t screw it up though by gong back and making a change to one of the articles that WOULD have qualified… (the one with the book review on “German Quickly”). I figured I had blown it anyway and that it would be better to make that change before the article got published rather than after. Here’s keeping my fingers crossed. Tonight at 11:59pm CST is the deadline to claim your Limited Edition Holiday Mug if you qualified! This was a nice challenge. Looking forward to April 10 2010. Congratulations to all 55 winners! You can expect to see your new mug in a few weeks. yay! Good job to all the winners! Wow! I seriously expected more than 55 winners. I thought there would be several times that many. ~176 qualified, but only 55 sent in a request for the limited edition mug. I got so carried away with 3 days to submit 25 articles(26 actually) that I clean forgot to ask for the mug! Yay! I’m looking forward to my mug! That’s one hard-earned mug and will be a constant reminder of what I can do if I set my mind to it! Congrats to all other winners! My mug arrived today. Thank you very kindly. It even came with a bonus leather coaster, how cool is that! Glad you like our little surprise! Since the holidays have already passed, we felt we needed to include something you could enjoy now that wasn’t holiday related. I think i missed the mug because my articles did not amount to 25 articles. But pliz pliz………………………..pliz am kindly begging whether i can be able to receive one because they are so beautiful. Next time I will be in more effort. Thank you very much. Looking forward for your response. My mug and coaster arrived yesterday. It’s great!! Thank you very much!! “Mr Donald Duck?” – yes, that’s me …. Is there any way to make sure that you send to the account name, and not the pen name in the future? Perhaps you qualified for this challenge under your pen name? hehe, my gamer tag for years has been “Insomnia Princess” and since I am active in many communities as an admin, moderator, etc. there have been a few times I received mail addressed to “The Princess” or just “Princess”. I haven’t been living in this new house very long, and the mail man always looks very curious at me, when he wakes me up early in the morning (10:30 AM). In case we’re not at home, I wouldn’t be able to fetch the packet in the post office, when it’s not carrying the name, I use for my account. Seriously, we’ve struggled with this issue before. Some people prefer that we not use their “real” name while others have problems like yours. We’ll keep working to find a solution. Would it be technically possible, if we wrote what name and address we would like to receive the rewards to, when we write to request our rewards? I mean – I, Pen Name, would like to receive my reward send to Real Name, Real Address, Real country? Not a bad idea – thanks. I’ll pass it on to our Developers. Have just received my cute lil mug when I arrived home. I don’t see my name on the list, but I qualified and sent a request, even got confirmation of it. Whom do I contact about getting my cool mug? We’ll look into it for you and contact you privately. Hello,I am rowan atkinson. I agree with you. I am glad and happy for you. This is a wonderful opinion. We have a new system in place, so it’s no longer necessary to send an email requesting the rewards. You can now register for all challenges on the Member Interface; your shipping address will be checked at that time. I still would like it to be possible to choose the shipping NAME as well as the shipping address. This would help me a lot. And you’ll probably get a lot less mugs returned. That’s great news, Marc, thanks a lot!